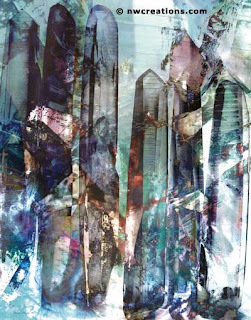 When we put together our 2010 Mind Body Spirit Odyssey Holiday Gift Picks, the artwork of Atmara Rebecca Cloe was one of our choice selections. 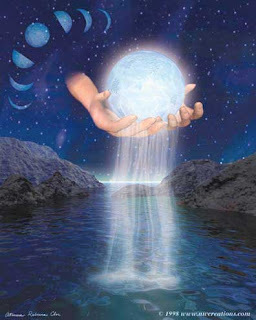 Atmara's stunning spiritual, healing and therapeutic images have the ability to uplift any viewer into a higher, more positive place. We hope you enjoy learning more about this inspirational artist and her beautiful work! MBS: Can you tell us a little bit about how you got started as an artist? Atmara: First, let me say, I have no formal training as an artist. I was working as a music teacher in the 80's and became ill with Chronic Fatigue Syndrome (which I continue to be to this day). I had to stop working, with the exception of teaching a few voice lessons each week, and I dedicated myself to my spiritual growth and awakening. In the mid 90's I found myself in a place in my life where most of the people and social/spiritual community I had been a part of was dissolving; really just a natural progression of people moving on to what was next. What was next for me turn out to be computer art. I have always had an interest in art, but do not have the coordination in my hands to be successful with traditional painting and drawing. In the synchronistic way my life seems to unfold, I saw an ad in a local paper for a graphic design school which was not far from where I lived. This was just at the point where computers were becoming powerful enough to be used for art. I had no idea where my life was heading, but I was able to take a few classes at this school and manifest funding for my first computer. Since this was 1996, the Internet was just in its infancy. I started out with the idea that I was going to do web design, and in doing a little of that, someone asked me to create 6 images for portal pages for a site that was going to be a resource for the arts and spirituality. The site never got off the ground, but I created 6 pieces of art, several of which are still marketed today. I had no idea I could do this, but I found I had an eye for what worked, visually and energetically, and the ability to teach myself computer software, and things just progressed from there. MBS: For those who aren't familiar with your work, your artwork revolves around spiritual imagery. Primarily Mandalas...but also some really great crystal related work. 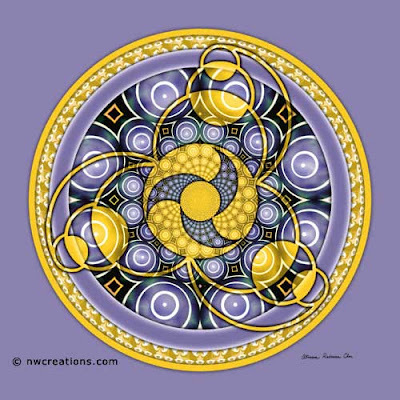 Why Mandalas in particular? Atmara: I started working first with New Age imagery and a couple of software programs, Bryce and Poser. They are 3D programs for landscapes and human figures. I didn't actually do my first mandala series until the end of 1999. I wasn't well acquainted with the form, but something just drew me to try to make some. Between 2000 and 2005 I did both figurative work and began to explore more with mandalas and some abstract imagery. Since 2006 I have done nothing but mandalas and a few abstract pieces. There never has been a conscious choice about what I create. I would say the images call me to create them. I don't know why I currently only doing mandalas. They are just what wants to be created through me. I love them, and I love the process of creating them because I have no idea when I start what they will look like, and I get to witness them emerging on the screen as I play in Photoshop. So why mandalas? I think you have to ask the mandalas themselves. I'm really not the decision maker in this process. MBS: Yes, it's interesting how they kind of create themselves! I agree with that! I don't work with computer images so I'm not familiar with the process you use at all. Do you ever start from a particular image that you then work with? Or is it more just starting with patterns and colors? Atmara: It's a little of both. I use images that either attract my eye because of their colors or their energy. I put them through a kaleidoscope filter first, then I choose 2 or 3 of them and work with them in Photoshop. Each becomes a layer which I blend together with the other layers using the blending modes in Photoshop. I play with color adjustments, with effects filters, really I just play using all the features Photoshop has to combine the kaleidoscope images until the composite image looks and "feels" finished. MBS: I've seen your artwork sold and marketed under the tile "New World Creations". Is that the name of your company? How did that come about? Can you tell us a little about it? Atmara: Yes, that's the name of my company. 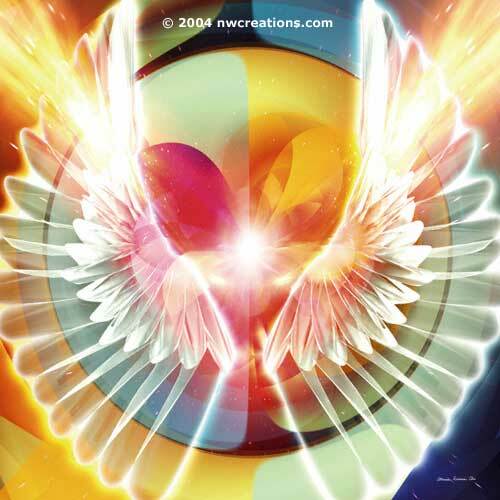 When I began doing digital art in 1996, I decided to work under a company name rather just as Atmara Rebecca Cloe. There's really no story to it. I just asked the question, "What should I call my company?" and New World Creations popped into my head. So I used it. 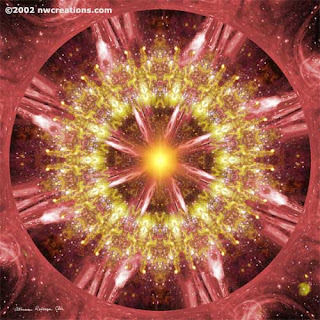 MBS: Mandalas imagery...I know from experience, that there are a number of people who are not familiar with Mandalas at all. What is the explanation do you give about this beautiful symbol if asked? Atmara: Actually, I can't remember anyone asking me what a mandala is. I guess when they see my work they at least figure out that it is a circular form of art. I just went to Wikipedia to see what they have to say and this is the first line "Maṇḍala is a Sanskrit word that means "circle". 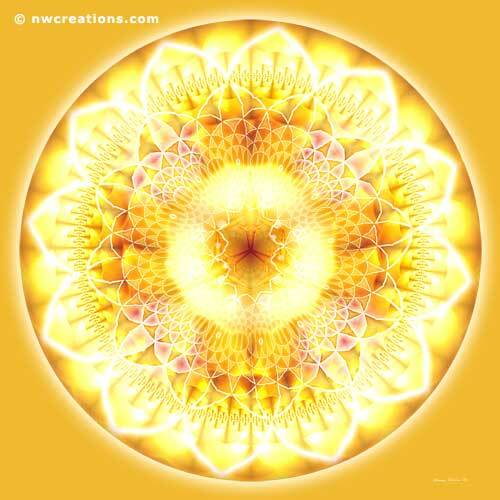 In the Hindu and Buddhist religious traditions their sacred art often takes a mandala form." For more details about the history I would refer people to an explanation from Wikipedia. MBS: For many artists, spiritual development and creating spiritual art go hand and hand. Can you share some of your thoughts and experiences with this? Atmara: I would say they have certainly gone hand in hand for me. When I first started creating art the imagery was very New Age which was a reflection of what I was exploring spiritually. I was inspired to create by seeing the artwork other New Age artists were creating. In the last 5 years, I have been a student of Gangaji (and actually learned the video editing skills I use for my mandala meditation videos while volunteering for The Gangaji Foundation. My work has been almost exclusively mandalas during this time. It hasn't been a conscious choice. As I said in an earlier question the art creates itself through me. Perhaps the truth of who I am (which is the primary discovery I've made as Gangaji's student) finds it easier to express itself through an abstract form. I would find it almost impossible to describe in words that which I have realized spiritually in the last 5 years, so the creation of an abstract form of art seems to be in alignment with that. MBS: What is a typical work day for you? Do you work every day on your images or are you less scheduled about it? Atmara: I don't have a workday as such. Because of being chronically ill, most of my energy on any day is spent just doing the things we all do to take care of life. I do try to post on my Facebook page, Mandalas by Atmara, each day. I seem to be an information gatherer. 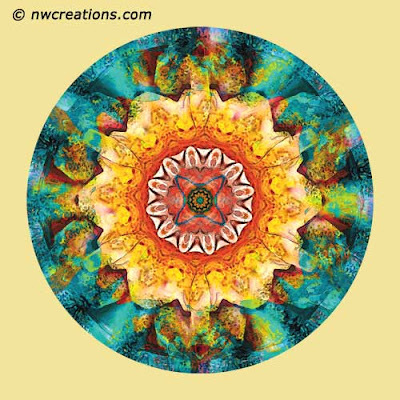 I've naturally falling into a role with this page of not only showing my mandalas and mandala videos, but of posting links to interesting mandala related web pages. I have a Google Alert for mandalas, which means they send me a list of links each day related to mandalas, whatever they have indexed in the last 24 hours I assume. So from that I post anything I think will interest the "likers" on my Facebook page. But other than keeping up with the Facebook page each day, there is nothing else I do on a daily basis. When I do have some extra energy and am inspired to do so, I'll work on a mandala, or a mandala meditation video, but there is no schedule to that. It just happens when it happens. MBS: How do you market your art? Atmara: I have always marketed my work online. Again the illness dictates this since I'm not able to go around to stores to market my prints, or organize shows, or sell at street fairs. When I first started creating art the Internet was very new. Ebay had just started and it was possible to get your work seen there, since there were only a few thousand people using it, rather than the hundreds of thousands that are today. There were also other smaller auctions where I could list as well. In those days I made my own prints and sold them directly through these auctions. But they got too big for my work to be seen by many people, and it was taking too much energy to make my own prints, so luckily, Zazzle.com can into being. I started with them when they were just in their beta stage, hadn't even officially launched, and they were only selling prints at that time. Now they are a huge company that sells not only prints, but all sorts of gift items as well. I sell exclusively through my store there now. I've always had a website. Last year I did a complete renovation, changing it from an old html site to a Wordpress blog and content management site. The site still points you to Zazzle to purchases prints, but I do also license my work. I would say that licensing has actually been the biggest income generator for me. It has dropped in the last few years with the economic down turn, but all my work is available to license. And I also create personal mandalas. You can find out the ”what and how” of that on my site as well. MBS: Do you have any advice for those who wish to (seriously) pursue an artistic path? Atmara: Follow your heart. In fact, that would be my advise to everyone, about all their decisions in life. If we all lead with our hearts instead of our minds, from love rather that fear, this planet would be transformed. MBS: Thank you very much for interviewing with us! Your work is just beautiful and it truely helps make the world a more positive place!